The other night, Lono and I had to make a late night run to Walmart to get some medicine for his daughter, and while he was searching for the right medicinal concoction, this caught my eye. Can you guess what it is you are looking at? Here’s a closer shot of the hilarity, after the jump. Obviously Microsoft is paying big money for these endcap displays, and I can’t help but feel they might have a problem with this. Alex and I have decided that at least one misguided parent or relative, is going to see the Xbox logo, and pick up a controller for the wrong system. 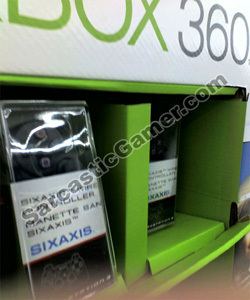 Given the sales numbers for the PS3, I can’t guess I blame Walmart for doing ANYTHING to unload all of those extra Sixaxis Controllers. 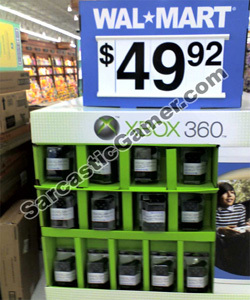 Seriously though, this is why I never ask a Walmart representative about a new game. It would be like asking a homeless person for their opinion on adjustable rate mortgages. In any event, when we pointed out the problem with the display, a store representative told us that they came from Microsoft that way. Somehow…. I just really doubt that.